Based on the bird ecology theme, this lottery type game uses a high definition screen design. 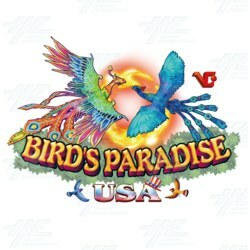 Bird Paradise USA supports up to 10 players simultaneously allowing for high popularity in your gaming center. This game offers 18 different type of birds, 10 different kinds of special power items within a clear, detailed undersea scene. Game Play Features Special Item - Floating in the field. Attack them to release special power. Phoenix Flame - Randomly upgrade normal bullet to powerful Phoenix Flame for free. Sky-Quake Drum→Sonic attack the birds near the Sky-Quake Drum. Wooden Mechanical Kite→Wooden Mechanical Kites assault all normal birds in the field at once. Special Item - Floating in the field. Attack them to release special power. Phoenix Flame - Randomly upgrade normal bullet to powerful Phoenix Flame for free. Sky-Quake Drum→Sonic attack the birds near the Sky-Quake Drum. Wooden Mechanical Kite→Wooden Mechanical Kites assault all normal birds in the field at once. Bird King→The bird with whirlwind. Kill all same kind birds in the field. Colorful Phoenix→Attack the Colorful Phoenix has a chance to drop a feather. - Successful defeat it will win a high score award. Smash The Golden Egg→Collect 5 feathers drop form the Colorful Phoenix will launch the bonus game. Lucky Bird→Kill any normal bird has a chance to become Lucky Bird, and get 2 to 10 times scores.